Grand Canal Dock is located within the business district of Dublin City, located on the south side of the River Liffey. The station at Grand Canal Dock was opened in 2001 to serve the new offices and commercial buildings around the Grand Canal basin which have gradually become established in the area over the last ten years. The station has up and down platforms, the up side effectively an island platform which is not in regular use. Part of the platforms at the north end of the station are located above the canal basin, while the station buildings are located at the south end on the down side. 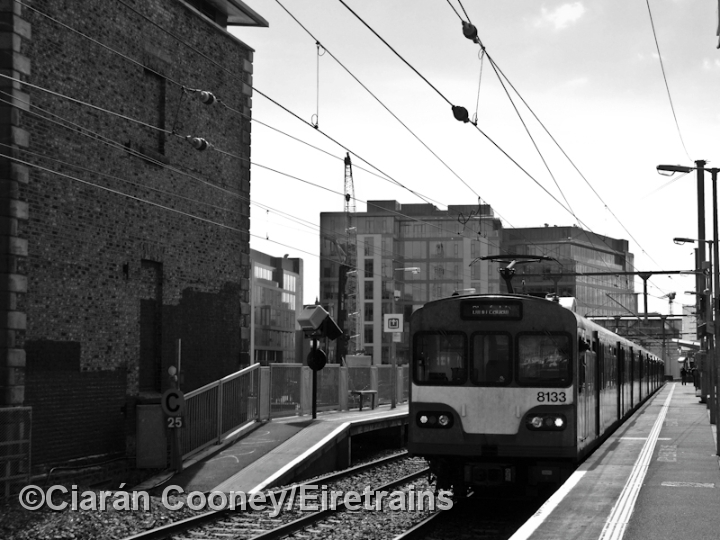 Before 2001, the station site was the former Dublin & South Eastern Railway workshops until 1925, after which it was developed into a locomotive and engineering depot. 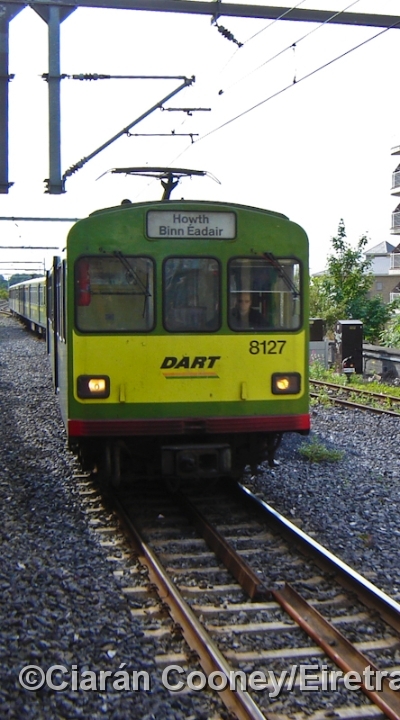 1 8100 Class DART No.8127 approaches the station at Grand Canal Dock with a stopping service to Howth. A restricted speed limit for up trains is incurred here because of the awkward track layout which 8127 is negotiating. 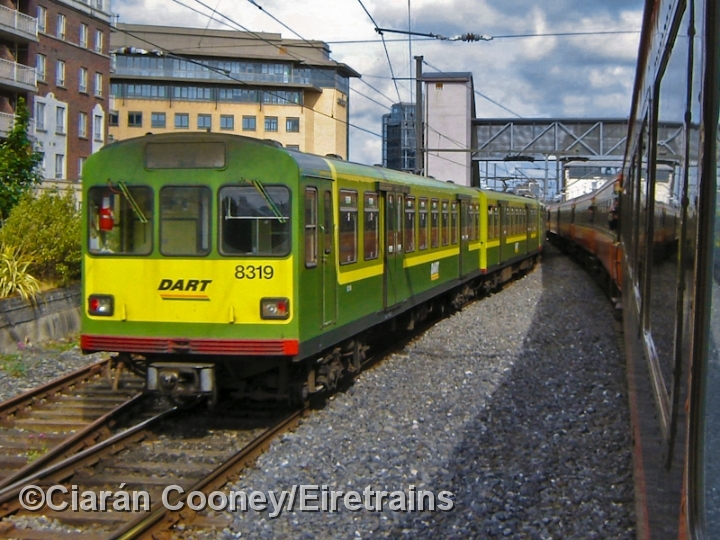 2 No.8319 is the rear unit on this northbound DART service stopping at Grand Canal Dock Station. No.8319 is in its original condition when delivered to CIE in 1983 by Linke Hofman Busch of Germany. All of the 8100s have since been refurbished. 3 One of the refurbished 8100 Class DARTs, No.8133, pauses at the north end of Grand Canal Dock with a Sunday morning service from Bray to Howth. 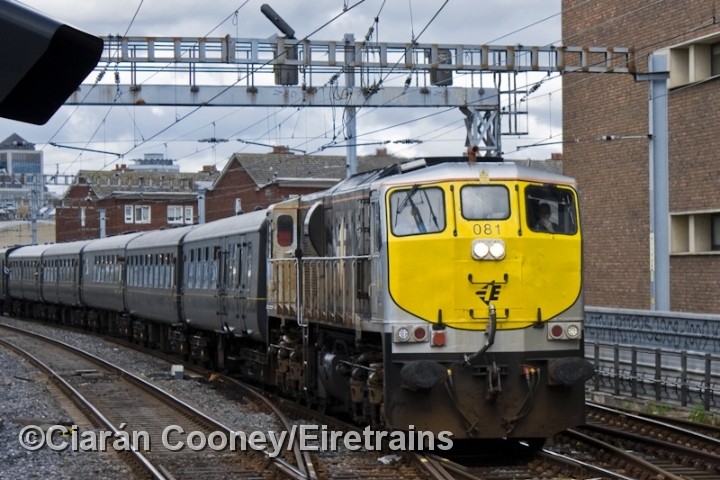 4 With a cluttered skyline, 8100 DART No.8335 is glimpsed on the rear of this northbound service to Howth seen having departing Grand Canal Dock. To the left are the sidings associated with the Boston Yard, now used for stabling diesel railcars. 5 This is another view of the Boston Sidings, located on the up side of the line just beyond Grand Canal Dock Station. 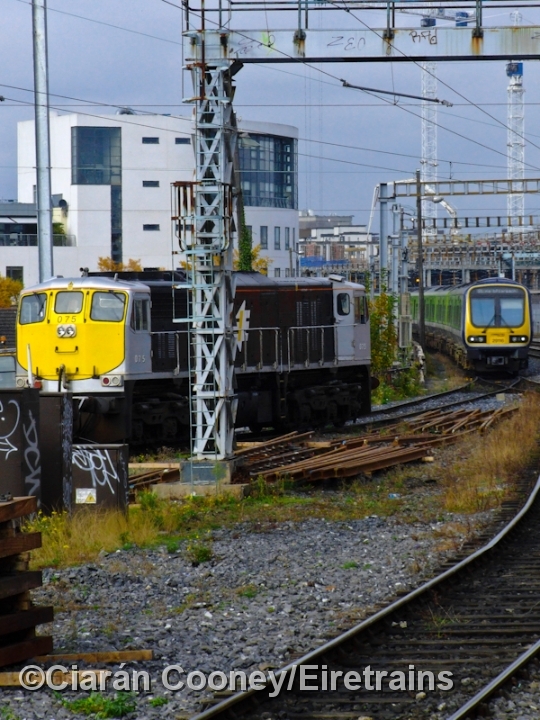 The sidings are located on the site of the original Dublin & Kingstown Railway workshops of the 1830s. 071 Class loco No.075 is seen loading a flat wagon train with rundandant rails. 6 Over the years the sidings in the Boston Yard have been simplified, leaving now just two which creates limited available space for stabling trains. 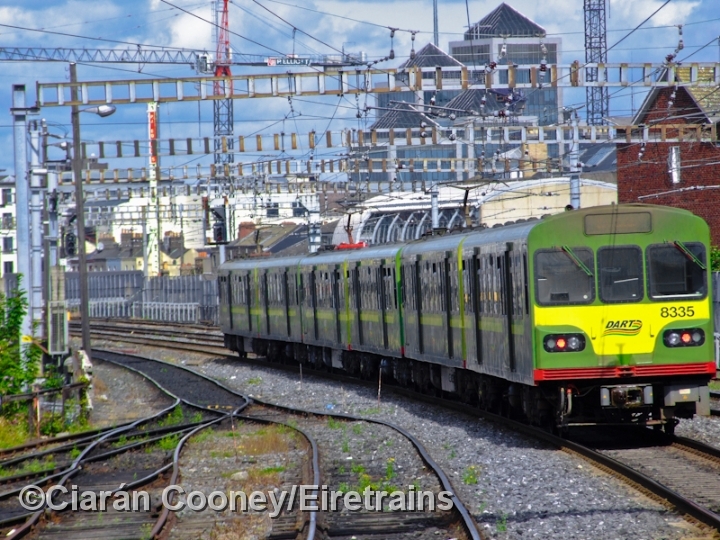 Here a 29000 Class railcar, No.29116, has just arrived having terminated at nearby Pearse Station. 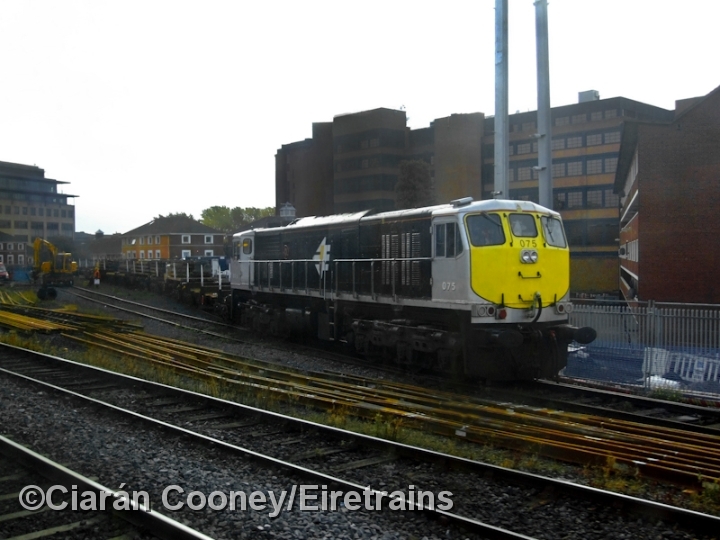 7 Another 071 Class loco, this time No.081, approaches Grand Canal Dock with the Railway Preservation Society of Ireland's railtour to south Co.Wexford, formed of their ex British Rail built Mk2 coaching stock. 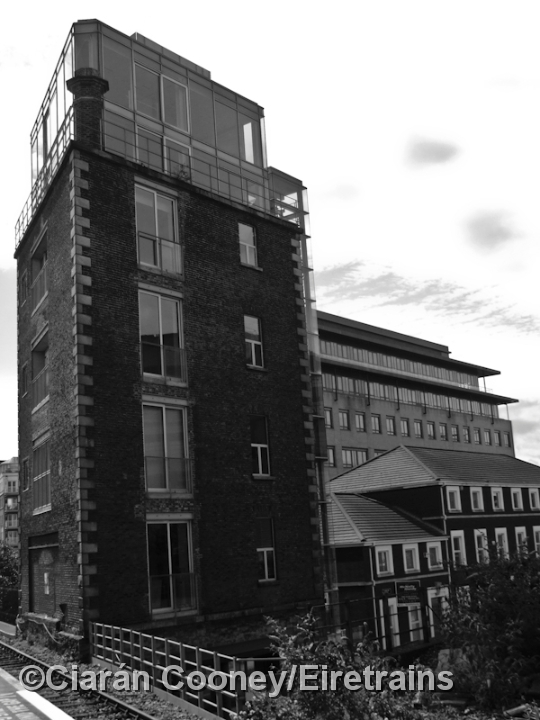 8 The surrounding area at Grand Canal Dock in Dublin City are a mixture 19th century industrial buildings and modern office and apartment blocks, as seen here on the up side of the station.